A photo sharing app for android and IOS. A powerful python 2D plotting Library. A virtual pin board to share things you find on the web. creators of firefox, browser and OS. And many more. This encouraged me to start learning Django and try building my own web application. But when I started searching for resources, I found it difficult as a beginner to find and install what I needed to get it running. I was confused because of the variety of choices I was given when I decided to install and set it up. But after a lot of searching and experimenting, I found the exact method to do it , which is good enough for a beginner. So, let's start. If you don't use Ubuntu 14.04, we have a Django tutorial for Ubuntu 16.04 at howtoforge as well. or any other version installed. If not, then, it can be downloaded from HERE. Please do note that in some linux systems SQLite is preinstalled along with python, in such cases, the above command can be ignored. 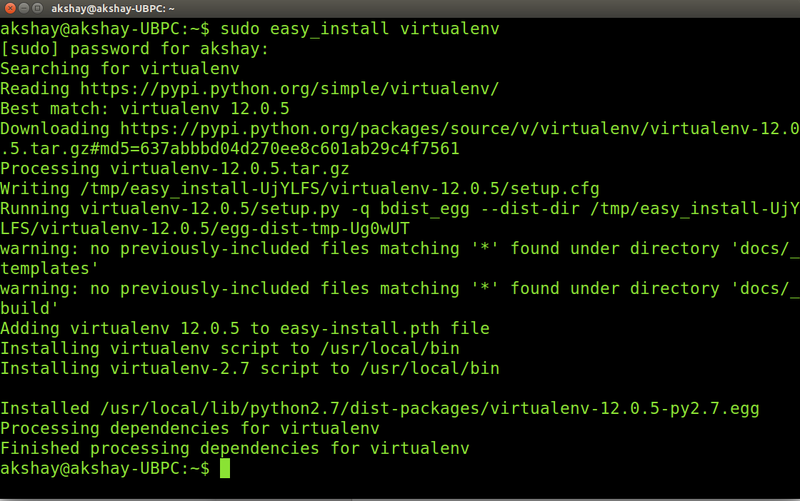 The above command installs the required python setup tools along with easy_install. Most of the cases, "pip" is preinstalled. If in any case it isn't, install pip as given in the official documentations HERE. 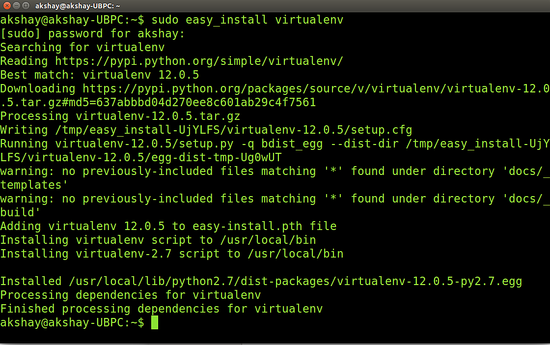 Before proceeding, confirm that python, SQLite, pip and easy_install has been installed. To do so, use the commands one after another given in the image below and the output of each command should be similar(not same) as shown in the image below. In this step, we install a "Virtual Environment." After a lot of searching and testing, I found that Django can be run very easily on a virtual environment. A virtual environment is created to encapsulate all the data and resources required to run Django at one place so that all the changes made remain in that environment itself. Another important benefit of the virtual environment is that it supports the light weight web server provided by Django by default. This allows the installation and integration of apache server to be avoided. Be patient, as it may take some time depending on the speed of the internet. When finished, the terminal output should be similar to the image below. at the beginning of the prompt , it means that the environment is started. Refer to the image below. Navigate to the folder django-user using the command. Upon listing the items in the folder using the "ls" command, you will be able to see directories like bin, lib, include, local. So what this virtual environment does is that any command or operation performed in the environment will not affect anything outside the environment. So the changes are isolated and this allows us to easily create as many environments as we want and test many things very easily. As a reference, view the following image. Note that the beginning of the prompt says (django-user) which means that you are currently in the virtual environment and before installing django, you should be within the "django-user" directory. This is very important. Thats it! Django is installed on your system with all required functionality for beginners to develop and learn the framework. Now you can go ahead and try out the DJANGO tutorial to learn the different functionalities and run your first web app. You can find the tutorial in the official Django documentation HERE. So every time do we need to activate the virtualenv by giving source django-user/bin/activate and then we need to do our action.? Brilliant, easy to follow for Ubuntu users and will be a great help on the One Month Python course, as this mirrored the mac instructions pretty closely. Thanks alot, the only tutorial that has worked and wasn't boring. Never before have I been able to perform a task so seamlessly. This is very helpful. Thanks a lot. With love from Kenya.